The Great Society is a failure. All it’s done—as any government program does—is push more people into needing it. Welfare doesn’t raise up the poor, it pushes down the non-poor until they become poor enough to need welfare. It’s not that it was necessarily a bad idea. It’s that it was implemented by government, and government fucks things up. And the complications! It’s a full-time job just figuring out what you’re eligible for, when your full-time job should be finding a full-time job. Back in the seventies, I remember government cheese: it was a relatively flavorless cheese good mainly for melting on fried foods. My grandmother was eligible for it, and so I got to try it on occasion when visiting her.1 As I’ve said before, I think EBT is a good evolution from government cheese. Food stamps are a voucher system that works, and it works mainly because it gets the government out of the business of making food or controlling what food people eat. I’d take it one step further. We still have government cheese; we have it in housing, for example, and even EBT still has a touch of the cheese in it. Those on EBT cannot, for example, choose to take those funds and save them to pull themselves out of poverty. They can only buy food with them. If we want to reduce poverty we ought to give the poor less cheese and more control over getting out of poverty. A single combined fund coming from their state. They can use it for whatever they want. Provide basic training on how to manage finances. If they spend it before it gets replenished, their only recourse is private charity. The last two are important: if we start adding more cheese on top of the lump sum, we are not helping those who need the help. We’re continuing to push them into victimhood. Because what’s important is that they are in control. If they want to prioritize their kids’ education over food, they can do that. If they want to prioritize drugs or gambling, they can do that too, and they will go hungry. But all the money will be given in an easily-reportable lump sum. There will be no exaggerating welfare funding or exaggerating its paucity without blatantly lying. A simple system will also free up resources that currently go to the bureaucracy rather than to the poor. This is a lot like Charles Murray’s plan to replace the welfare state. A great example of government cheese on the local level is our education system2. Administrations grow and teaching staff wither, and because parental choice is removed from the equation politicians and bureaucrats have to come up with ways to simulate the effects of the choices that parents would make in a free market. Thus, we get universally-hated assessment tests such as those mandated by the No Child Left Behind act, which, because they are a government program testing whether government programs and employees get money, engender corruption administering the tests. Everyone involved in the money flow—administrators, teachers, local politicians—want the schools to do well on the tests, regardless of whether the students themselves are learning. From Baltimore to Atlanta to Columbus to El Paso to Indianapolis to Philadelphia to Connecticut to DC, when government chose to tie funds to test performance, government chose to cheat on test performance. The money loop doesn’t include students, which means that the system does not cater to students. Government teacher unions lobby local and state governments for more pay, benefits, and job security, and some of that money gets funneled back to local and state politicians who vote for more pay, benefits, and job security, to the point where criminal teachers are maintained on school payrolls even though they aren’t allowed to teach. It’s about time we freed teachers from governments and politicians. Government fucks things up, whether it’s cheese or education. The effects on higher education are ameliorated because there is still an ostensibly private system of higher education, and because even government colleges have to compete for students, but the big hand of government in higher education is student loans. Student loans are crack to inexperienced borrowers and free money to experienced administrators. Children who have never had any kind of a loan start on a road at seventeen to owing more than the cost of a new car, and sometimes even a house. I used to work at a university in San Diego. I remember walking behind two students discussing digital vs. paper textbooks. One student was trying to convince the other that digital textbooks were the way to go: they were easier to carry, easier to search, and easier to quote from, and, most importantly, less expensive. The other student replied that, yes, that may be true, but you can’t sell ebooks back to the bookstore at the end of the year for cash. The money to pay for the books didn’t come from the student, but the student did get the cash back. There is no reason for schools not to enable such scams for textbook publishers, and every reason to enable even bigger scams on the administrative, state, and federal level. It isn’t their money, and they aren’t left holding the bag. There is no reason, given the current student loan system, for a school administrator to recommend a career path that will result in a good life over a career path that will result in life-long debt. The school gets their money either way. And every college degree whose knowledge could just as well be gained as an outside specialty or some afternoons in a library4—and that aren’t worth the loan that paid for them—is higher education government cheese. Part of the problem with federal programs is that they become one-size-crushes-all. What was poor in New York City, or Washington, DC, was not poor in White Cloud, Michigan. Although our local government schools are slowly being federalized into national government schools. One obvious fix is to change the law to allow student loans to be discharged in bankruptcy, and to make the college bear responsibility for paying off the loan if it is discharged. Or, increasingly, online. Learning a hobby or minor specialty is becoming easier and easier using nothing more than resources literally at your fingertips. 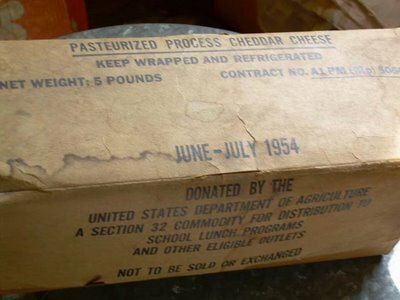 Government cheese goes to school last modified July 8th, 2014.